Kerry have suffered their first defeat in the Allianz Hurling League Divison 2A, following a seven point defeat at the hands of Carlow in Austin Stack Park Tralee. Padraig Boyle had Kerry off to the optimum start with a great point in the first minute. Both sides exchanged scores in the opening 8 minutes as Shane Nolan pointed for Kerry with Denis Murphy pointed twice leaving the sides level at 2 points. Kerry narrowly held a 2 point advanatge in the opening 18 minutes as Shane Nolan, Shane Conway and Padraig Boyle pointed giving Kerry a three point lead before Diarmuid Byrne reduced the deficit back to 2 points. Carlow began to comeback into the game and led by 2 points by the 24th minute with Denis Murphy, Martin Kavanagh and Richard Kelly all adding scores. By the 30th minute however Kerry were back level, Shane Conway with the deciding point making it all square again at 8 points. 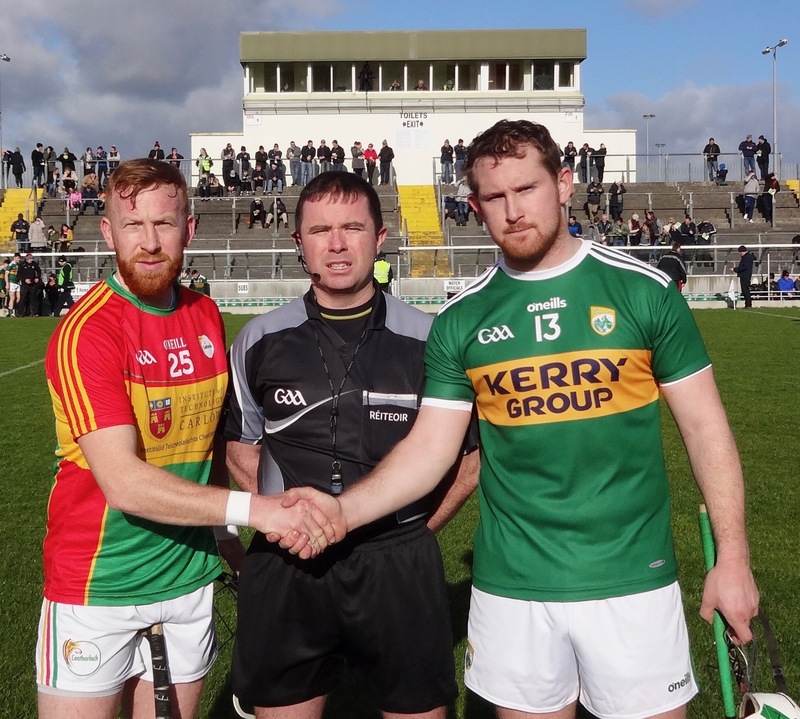 Martin Kavanagh edged Carlow in front shortly after but Kerry still had the momentum on their side and just before half time Brandon Barret barged through the Carlow defence and hit a shot low and hard past Brian Tracey. The scoreline at Half Time reading Kerry 1-08 Carlow 0-09. Carlow came out firing in the second half and were ahead by a single point 4 minutes after the restart with Jack Kavanagh pointing either side of two Denis Murphy points. A tough and tight affair continued all through the half with neither side giving an inch in the opening 10 minutes. By the 48th minute Carlow had managed to secure a two point lead with Martin Kavanagh and Denis Murphy both pointing. The experienced duo of Shane Nolan and Padraig Boyle had the Kingdom level on the 56th minute as they managed points leaving the scoreline at 1-11 to 0-14. Carlow managed to edge back in front as Chris Nolan pointed inside the 21 yard line minutes later before the red mist would descend over Austin Stacks Park, with just over an hour gone, James O’Connor was shown a straight Red card for striking the wrist of Denis Murphy and given his marching orders by Referee Rory McGann.